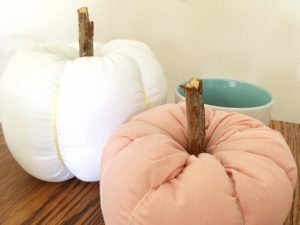 The first time I saw these fabric pumpkins was actually in the form of a gift from my mom. My parents occasionally take a little weekend getaway and they love stopping at little crafty fairs. My mom bought me a cute little fabric pumpkin that was immediately added to my fall decor. 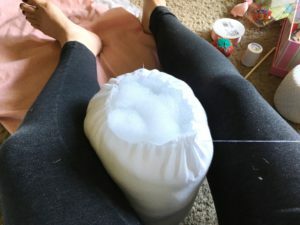 I never even thought then about making my own! Until that fateful day I stumbled across this DIY on Pinterest. Then an entire world of soft pumpkiny possibilities opened up! I could choose whatever colors or sizes I wanted. I don’t know about you, but for a recovering control freak, that excited me. My tendency is always to go for bright colors and complex patterns. That’s fine for an accent piece here & there (and honestly, could work great with these pumpkins!) 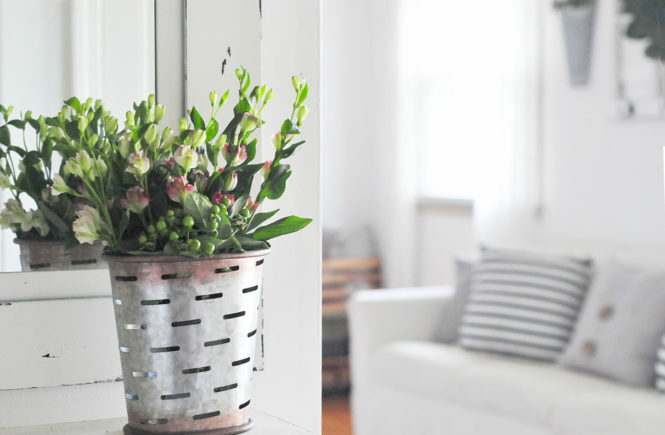 but I am training myself to go for simpler, more neutral colors in my decor. Thank you, Joanna Gaines. That being said, I chose white and pink for my first couple of pumpkins that I will share with you here. My goal was simplicity, so I grabbed whatever I had lying around. That meant I used a white bedsheet & a pink pillowcase for my fabrics. These pumpkins use a ALOT of batting (stuffing) so make sure you have multiple bags if you want to make a lot. I put wooden stems on these, but I may do fabric stems or no stems at all on the next bunch to make them more stackable. I love that look!! Let’s get to it! Needle & Thread, Fabric, Batting, Yarn Needle, Yarn or Jute, Measuring Tape, Pen/Marker, Scissors, Stick (if you want wooden stems) & glue gun. Sewing machine optional. 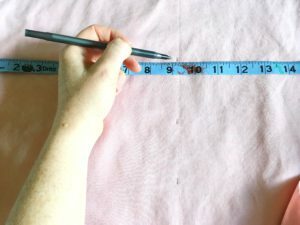 You want your fabric length to twice it’s height. So for my larger pumpkin I measured 12″ by 24″. The smaller pumpkin was 9″ by 18″. You will lose a bit in size once you’ve completed them. The larger one turned out more like 9-10″ and the smaller one more like 6″. I don’t have amazing scissors for cutting fabric & I am terrible at cutting a straight line. So I make marks all along the fabric to help me cut straight across. They’ll be on the inside of your pumpkin in the end so it won’t matter! Besides not being able to cut straight, I really struggle to do much more than sew a straight line on the machine. Thankfully, that is all you have to do here! Just bring the ends together and sew. Now your little pumpkin fabric is as wide as it is tall. 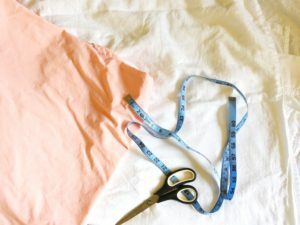 Make sure to only sew that one seam. The top and bottom should remain open. Ok, get out your little needle and thread and get to work! This will be the bottom of the pumpkin. Just thread your needle in a loose, wide stitch, all the way across. This is a “running stitch”. Once you get to the end, pull! 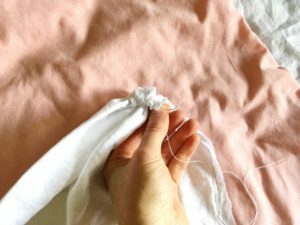 Once the fabric is gathered together, stitch it to hold it in place. Stuff that pumpkin full of stuffing!! Think you’ve got enough? Add more!! You want to fill it until you can’t fill it any more. And then add just a tad more, so it’s spilling out over the top. Now, do another running stitch around the top, pull it closed and stitch it shut. 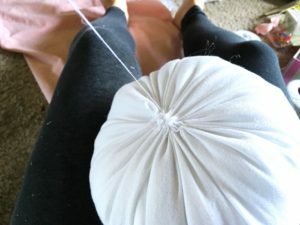 This was the easiest way to keep the pouf steady so I could sew & then pull. 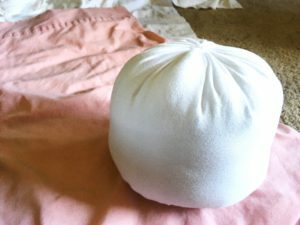 A cute little pumpkin pouf, ready for its ribs! These were super inexpensive at Walmart for only $1.77 – it’s a good thing considering the shape mine was in when I finished my two little pumpkins. Time to give your pumpkin “ribs.” Yes, that’s what they’re called. I googled it. 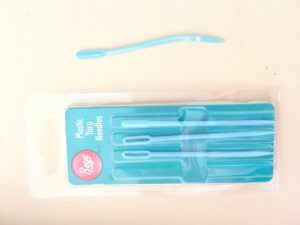 Grab your plastic yarn needle (you can use a metal one, but it may be so sharp that it will injure you) and thread your yarn or jute through the eye. Start at the bottom of your pumpkin and squish it through the middle and out the top. Then back around to the bottom and out the top again, 6 times (or more if you choose). This way you create six even sections of pumpkin. Be sure to pull tightly each time you create a new rib so that your pumpkin has that charming squashed look. Mine wasn’t tight enough at first and I was able to pull on each one (kind of like a shoe lace) to correct the problem. Once you’re done, knot it off at the top. My daughter found a stick outside last night and it just so happened to be the perfect diameter to create stems for my pumpkins. It would probably be easiest to use a small saw to cut it down to size. 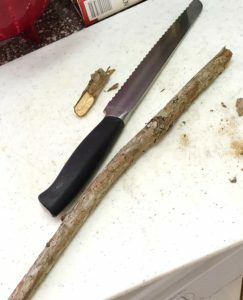 I improvised with a serrated knife, and while it took quite a few saws to get through it enough to break it off, it was still effective. Dot on a bunch of hot glue, then hold on the wooden stem for about 30 seconds so it has a chance to cool and secure the stem. You could then add extra jute or faux leaves, berries, ribbons, or whatever other decorations you want to spruce up your little pumpkin. 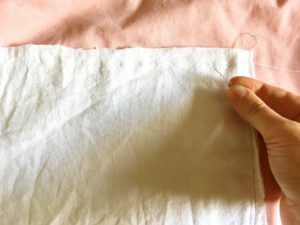 To make a stem out of fabric, just cut out two sides of a “stem” shape. Sew them, wrong sides together, flip right side out, stuff it, then stitch it onto the top. I love the look of these little pumpkins stacked in graduated sizes. I plan to create two sets for my mantel & I’ll be sure to share them with you when I finish them. By the time I do, it will be time to start decorating for Christmas most likely! Haha! So much in store for our favorite season!! Get excited! They might not be stackable on their own with their big ol stems on top, but stacking them inside this decorative bird cage helped me achieve the look I was going for. So great! I love it!!! Proud of your sewing skills!!!! Thanks! Me too. lol! I’ll have to make you a few. If you asked me, I’d say that I can’t either! Lol. It’s totally easy. 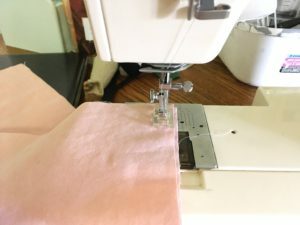 If you can push a needle & thread in and out of fabric, you’ve got this! These are so chic and perfect for fall decor. I wish I had better sewing skills to be able to make these… I would love a few pretty pink ones! I think you should go for it! My sewing skills (or lack thereof) are very basic & self taught. They come from a determination to make cute things! Anything beyond a basic, straightforward stitch in a straight line, and I’m lost! Those pumpkins are super cute. 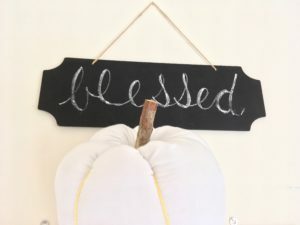 I love DIY fall decorations. Thanks for sharing. This is a craft I bet I could even do, which means its simple as can be! These turned out just darling!! These are so cute, what a darling autumn decoration. I love making things myself, you could do this in so many different fabrics. These pumpkins are super cute! I love simple DIYs like this. Thanks for sharing this step by step guide. 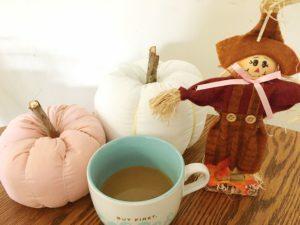 These are the cutest and perfect for fall decor! 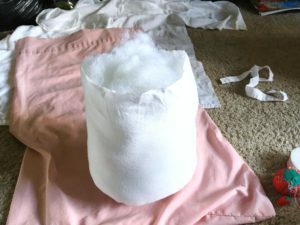 I love the fact that I could put these in storage for next year too and you could even make jack-o-lantern versions for Halloween just round the corner!! Such a cute idea and perfect if you have little ones who like to explore! Love that they can be used until Thanksgiving. I need that sign for my mantle though! Do you have a tutorial? I wish I did! This one I bought at Marshall’s. This is so cute and perfect! 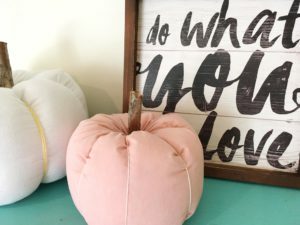 Fall is definitely my favorite time of year and I’m always looking for new ways to decorate around the house. Can’t wait to give this a try! You’re so creative, and it looked like you had so much fun doing it. I love it. I love this idea! It is great because you can mix and match the fabric depending on your decor. On a side note, I never knew that pumpkins had ribs! Those pumpkins are adorable! I wish that I could have pumpkin decorations up longer during the year! These look so easy to make too! I like that you used a real stick too! Such a cute touch! This is really cute! They turned out totally adorable. You lost me at the sewing machine though. I don’t have one of those. They look like they would make PERFECT fall decorations!!!! 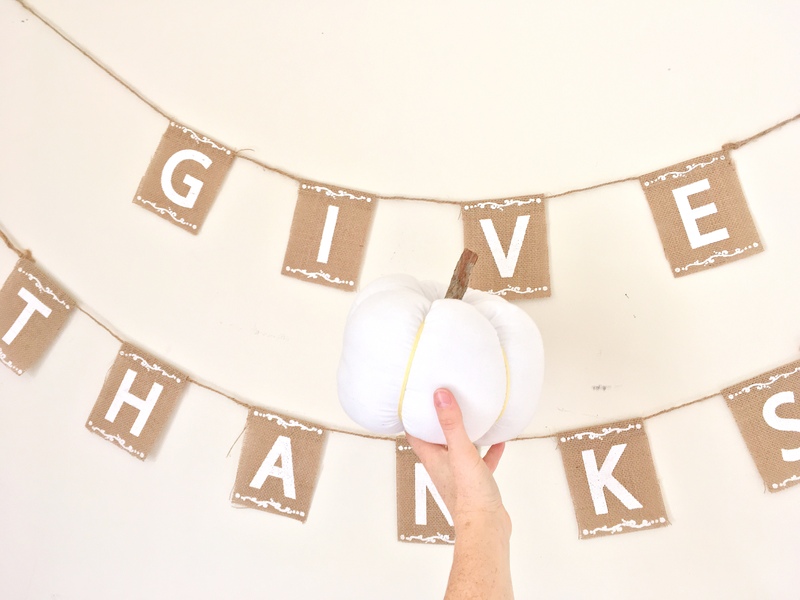 What a cute idea for fall! I love to craft as well and this looks like a good weekend project for me to get my hands on. These are so absolutely ADORABLE! Definitely suits how I would decorate my home. I’ll have to borrow my mom’s sewing machine. These pumpkins are absolutely gorgeous! I love the style and I love how affordable it is as well. Thanks so much for the detailed instructions. 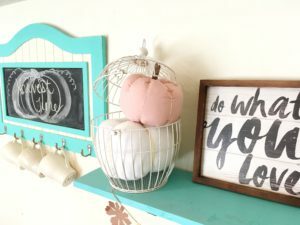 This DIY is definitely worth a try! These are so pretty! I am going to show this to my mom and see if she would like to make some with me. Oh my goodness, these are adorable and look amazing and super expensive when in fact they’re not! Thanks for the perfectly detailed instructions! We’re so glad you loved the post! If you try these out, we’d love to see how cute yours turn out, too!! !